The year 2014 has been marked out by the UN as “The International Year of Crystallography”. 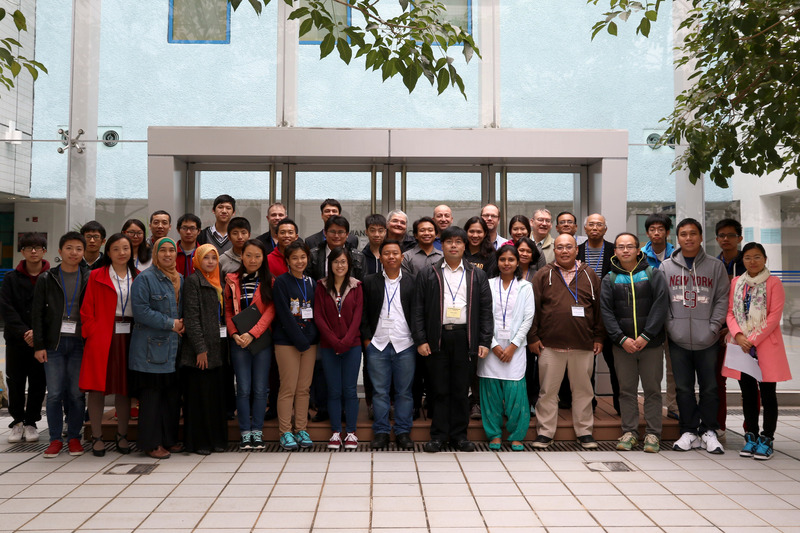 The arrangements for this were first publicized at the Asian Crystallographic Association meeting in Hong Kong which was held on 7-10 December 2013. Now that the year is drawing to a conclusion, it is perhaps fitting that one of the final official functions of the IYCr2014 will be an IUCr-UNESCO OpenLab to be held in the beautiful HKUST campus in Clear Water Bay. The Open Lab will be a 5-day workshop / school in chemical crystallography and is primarily intended for young scientists from around the region who are researching in the field. Participation numbers are strictly limited, since the workshop will have a number of practical as well as theoretical and discussion sessions. It is anticipated that non-local participants will be limited to 20-25 and local participants around 10-15 persons. To apply for a place, please fill out the registration form, and send asap by E-mail to chwill@ust.hk or FAX to +852-2358-1594. Deadline is 31 October 2014. Registrants will be notified by E-mail on the status of their application. Due to the generous support of sponsors such as the International Union of Crystallography (IUCr), UNESCO, Agilent Technologies and HKUST, and in keeping with other IYCr2014 Open Labs around the world, no fees will charged to attend the OpenLab. However a charge of US$300 is necessary as a Residential Fee for a single room (part of 3-bedroom apartment) on the HKUST campus for 6 nights (2 to 7 December). Breakfast, lunch and morning / afternoon snacks and a workshop dinner will be included for participants. Since space is limited, residential fees must be received in order to confirm your workshop place by the deadline of 15 November 2014. Further details for accommodation and registration arrangements will be sent later. Participants should arrive to Hong Kong on Tuesday 2 December and check in in the afternoon at the North Block of the University Center, HKUST. The reception desk is open from 08.00- 22.30. There will be a Welcome Mixer on evening of 2 December. Practical tutorials on growing, selecting and mounting crystals will be conducted at the beginning of the course. Those participants wishing to collect diffraction data on their own sample are encouraged to do so. They should please contact the organizers ahead of time to arrange this and send sample specimens, or materials for crystallization (maximum of two sample types) at least 2 weeks ahead of the workshop. Ideally samples should be non-solvated, non-volatile and non-hazardous. Where possible relevant MSDS sheets should be included for any samples sent. Two dual wavelength single crystal diffractometers – Agilent Gemini and Agilent Supernova instruments will be available in the workshop for practical demonstration classes and collection of diffraction data. Dr. Fraser White of Agilent Technologies will lead lab demonstrations in the use of the instruments, assisted by Dr. Herman Sung, who is in charge of the X-ray diffraction laboratory at HKUST. 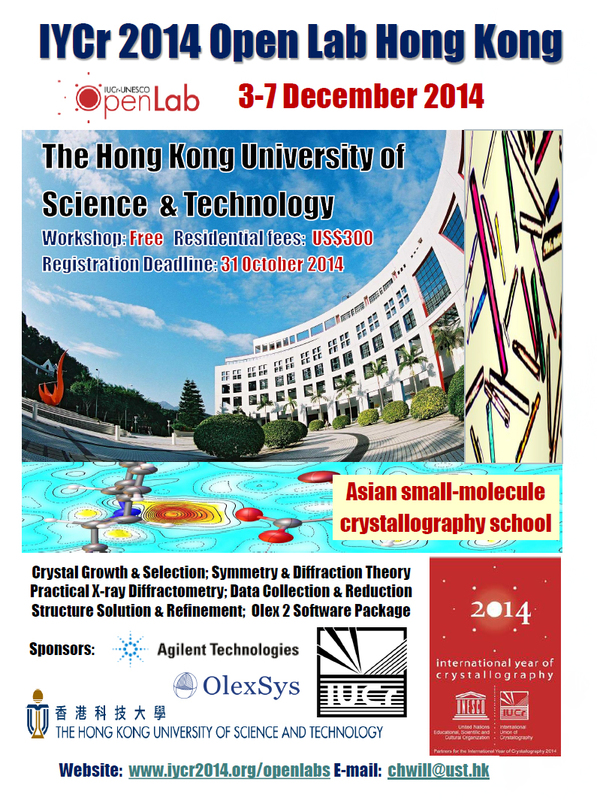 The OpenLab HK will incorporate a workshop on the use of the powerful crystal structure software package Olex2. This will be presented by Dr. Horst Puschmann of OlexSys. Little or no previous knowledge of the software is assumed, though many tips and advanced techniques will be provided for existing users. Participants are requested to download a version of Olex2 on their laptop computer before attending the workshop. It is available for free for both Windows and Mac platforms from the website http://www.olex2.org. The weather in Hong Kong in early December is usually pleasant; moderately warm and dry. Participants should check the detailed forecast before attending, since a range of conditions are possible. Hong Kong is well-known as a regional hub for air travel and should be readily accessible from most major cities of Asia. The workshop is being held in early December and should not be subject to high season fares, which can rise steeply near to the Christmas and New Year holiday break. It is anticipated that most non-local participants will enter Hong Kong via the international airport. In Hong Kong taxis are quite a reasonable price and from airport will cost around HK$300 (US$40) which is not bad for a 30 km 1 hr journey. Hong Kong also has an excellent public transport system. 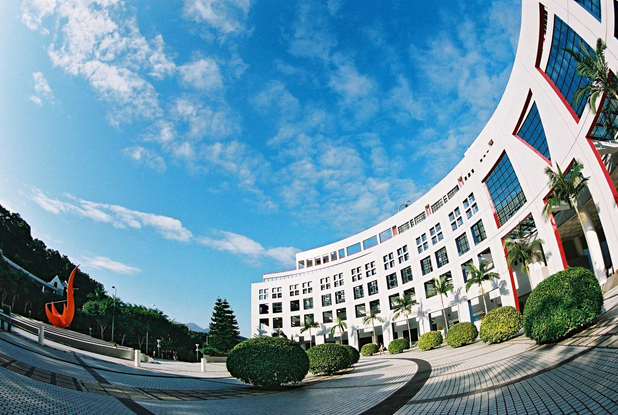 For details of getting to HKUST see http://ihome.ust.hk/~meyklee/HKUST_direction.jpg. The university campus is relatively straightforward to get around once you are familiar with it. Accommodations will be in the University Center, which is separate from the main academic building which is marked with the red circle in the map below. 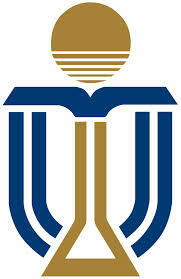 The International Union of Crystallography aims to promote the science of crystallography around the world. Its regional affiliate is the Asian Crystallographic Association (AsCA). The OpenLab HK offers an opportunity to provide impetus to develop the science and its practice in some of the less developed countries of the Asian region. With the relatively low costs we encourage participation from countries with relatively less research support. In exceptional cases, some limited travel bursaries may be available and request for this should be made of the organizers when submitting the Registration form. Applications to attend from outside the AsCA region are also welcomed, but in such cases note that travel support cannot be provided. Dr. Fraser WHITE, Agilent Technologies, Oxford, U.K.
Dr. Horst PUSCHMANN, OlexSys, Durham, U.K.
View of HKUST Campus from the sea... hope to see you here in December!